This Spring, add some color to your plate with this light and nutritious Zucchini and Yellow Squash Salad! The vitamins C and A, as well as folate, found in zucchini act as powerful antioxidants that ﬁght oxidative stress that can lead to many different types of cancer. Yellow squash is a brilliant source of vitamin C and a very good source of magnesium, vitamin A, fiber, folate, copper, riboflavin and phosphorus. It is abundant in antioxidants that keep free radicals at bay. With its high beta-carotene content, yellow squash is a great source of protection from pollutants and chemicals that lead to cancer. As a rich source of calcium, feta cheese allows you to take advantage of research suggesting that calcium (combined with vitamin D) helps protect the body against various types of cancer. 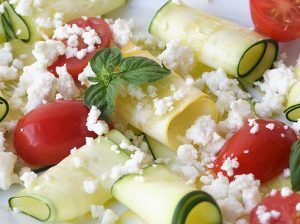 Eating foods like feta cheese sparingly, combined with a diet high in antioxidants to protect from the damage of excess inflammation, can ensure a healthy immune system. This appetizer or side can get you well on your way to eating the rainbow and protecting yourself and your loved ones from cancer! 1. Slice zucchini and yellow squash lengthwise into thin ribbons using a mandolin slicer. 2. Toss zucchini, squash, cherry tomatoes gently with lemon juice and olive oil. 3. Top with crumbled feta cheese.